The nineteen-sixties were a time of turmoil, vision, and change. The Cold War; the Kennedys; the race for the moon. Personally, it was the decade of my marriage, and the births of my children: in short, the best time of my life. In sports, too, the winds of change were blowing: goodbye, Bronko Nagurski, George Halas, three yards and a cloud of dust. Hello, Lance Alworth, Tom Sestak, Joe Namath and Johnny Robinson. So long to the Browns' orange pumpkins, hello to the 'Bolts! Enter below any AFL player name, team, fact, keyword/phrase, then click "Search"
. . . . Loading AFL Search Engine . . . .
BY LARRY FELSER/ Jerry Green, a sportswriter for the Detroit News, walked into the press suite at the Sheraton St. Regis Hotel in New York last spring during the pro�fessional football merger meetings. He glanced at some mail on a small table in an ante room. When he saw the return address on each of the six identical white business envelopes, he did a double take. "Ah, hah," shouted Green. "The terror of Amherst, N.Y."
The envelopes were addressed to Phil Iselin, K.S. (Bud) Adams, Lamar Hunt, Eugene Klein, Wayne Valley and Joe Robbie. Each man is president of a franchise in the American Football League. The return address on the en�velopes was 438 Maynard Dr., Amherst, the home of Super Fan, a citizen otherwise known as Angelo F. Coniglio. The Super Fan is hardly a rare species. He abounds in every city which houses a professional football team, tak�ing various forms. He may sit in your section of the stadium, cranking an objectionable siren or blowing an obnoxious horn. There is a fellow in Oakland who cranked his ear-splitting whistle all through the Raiders' record-setting 19-game losing streak in 1961-62. He may be a "foster parent" to the players, wining and dining them at considerable expense to himself. 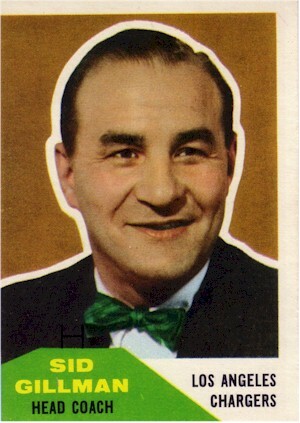 There is an old-time vaudevillian, a regular in Mike Manuche's steak house in Manhattan, who drove to Green Bay, Wis., last winter on a few hours' notice to take charge of mov�ing Vince Lombardi's household to Washington, D.C. when the Great One signed on as coach of the Redskins. The Super Fan may be a tireless traveler, following the team from coast to coast. 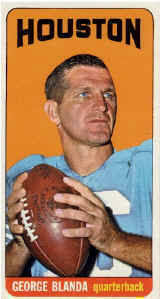 It is not unusual for the Buffalo Bills to encounter Druggie Lawrence, a Courier-Express distributor, in the lobby of the Marriott in Houston or the Stardust in San Diego on the morning of a game. 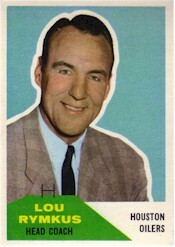 Slim Leslie, a South Buffalonian who works for the telephone company, used to spend his entire vacations on the asphalt apron of the Camelot Inn parking lot, watching the Bills belt each other around their training camp. But Coniglio does not fit any of these molds. He wouldn't be caught dead with a siren. The only player he ever knew well was Ernie Warlick, who lived a couple doors away until recently. Coniglio's driven to Rochester and Cleveland for a couple of exhibition games, but that's all. The only time he watched workouts was when his job took him to the Niagara Power Project and the Bills drilled next door at Niagara University. What Coniglio does is write letters. Hundreds of letters. Buffalo sports writers are his special target. A note from A.F.C. is enough to make amiable Jim Peters bristle or Steve Weller's teeth to grind. His most cordial pen pal is Phil Ranallo. But even "Honest Harry" Ranallo hung up a telephone on Ange in the midst of a heated discussion over the new domed stadium. "I dropped the receiver," claimed Phil, who called back a few minutes later to apologize. But Coniglio's points of order, bits of advice and bones of contention are not meant strictly for local consumption. He has frequent correspondence with club owners, sports writers all over the nation, the television networks, Com�missioner Pete Rozelle and assorted public officials. Not long ago he scored a grand slam. 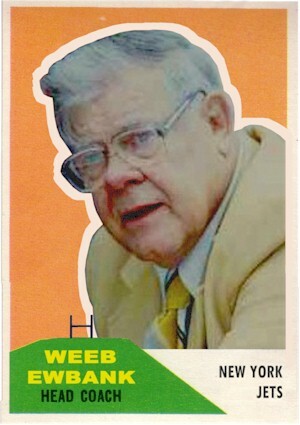 He had letters published in Sports Illustrated, the Sporting News and Pro Football Weekly, all within the same week. But it's not the quantity of correspondence - consider�able though it is - turned out by Coniglio which makes him unique. There is an oversupply of letter senders who regularly expend extravagant amounts of invective upon politicians, the press, etc. They are universally regarded as cranks. Coniglio is no crank. What makes him different is the sweet reason and intelligence with which he states his case. He scorns abuse, or at least crude abuse. His weapons are polite sarcasm, a finely-tuned sense of indignation, an ac�countant's head for remembering figures and an engineer's reliance on logic. The last is understandable. Coniglio earns his living as a hydraulic engineer for the New York State Power Authority. 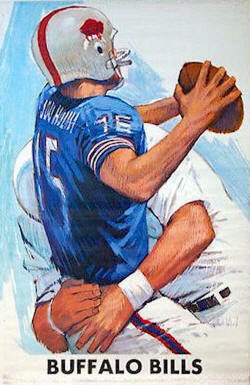 His avocation is the Buffalo Bills and, to at least an equal degree, the American Football League. He views the Bills' current dilemma more in sorrow than in anger. To him, the team's downfall can be traced to one dark day in March of 1967 when the Bills announced they had acquired split end Art Powell and quarterback Tom Flores for split end Glenn Bass and a quarterback named Daryle Lamonica. 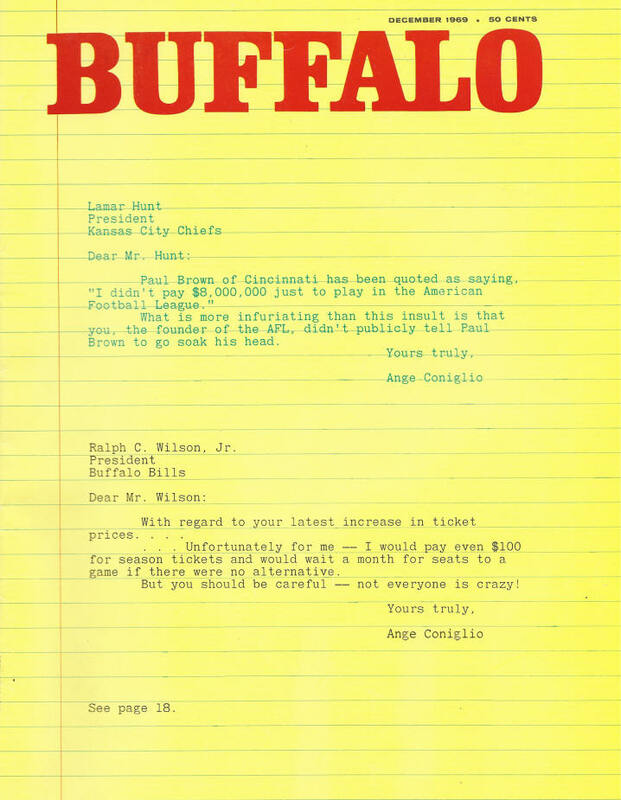 Angelo's letters descended upon the local papers within 24 hours after the trade had been made, predicting dire things for the Bills. Nothing has happened since to cause him to change his mind. 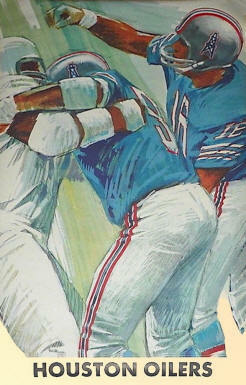 It was Lamonica's duel with Jack Kemp for the No. 1 quarterbacking job on the Bills which inspired Coniglio to become a letter-writing regular back in 1963. Not long ago he wrote to the Bills, pointed out that Kemp's 1969 statistics - completion percentages, number of touchdown passes, number of interceptions, etc.-were roughly equivalent to his statistics in 1964 when the Bills were champions. "I wasn't trying to make any case for Kemp's perfor�mance that year," says Coniglio. 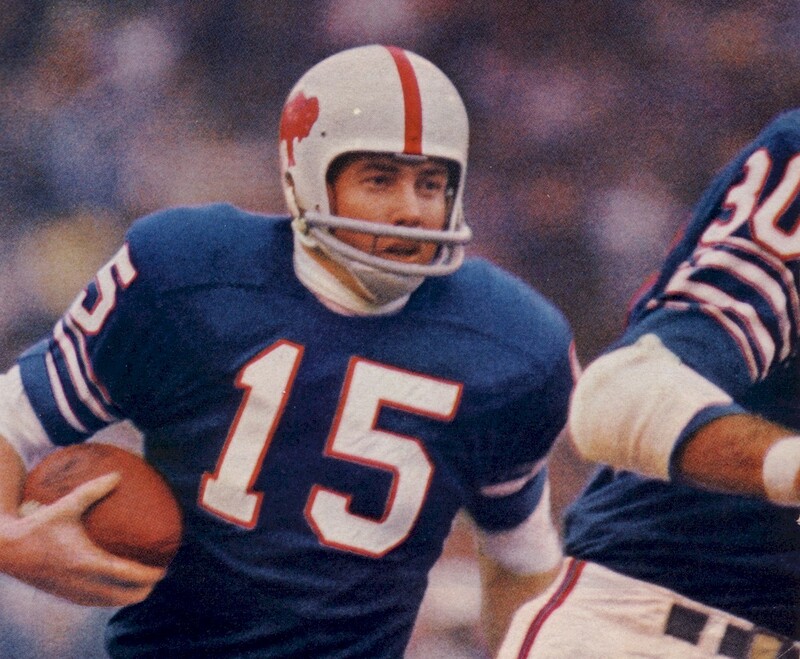 "I was trying to point out to the Bills that he was as bad in 1964 as he is now." But since the trade made the Kemp-Lamonica argument a mute point, Coniglio's real passion has been the retention of the AFL's identity. 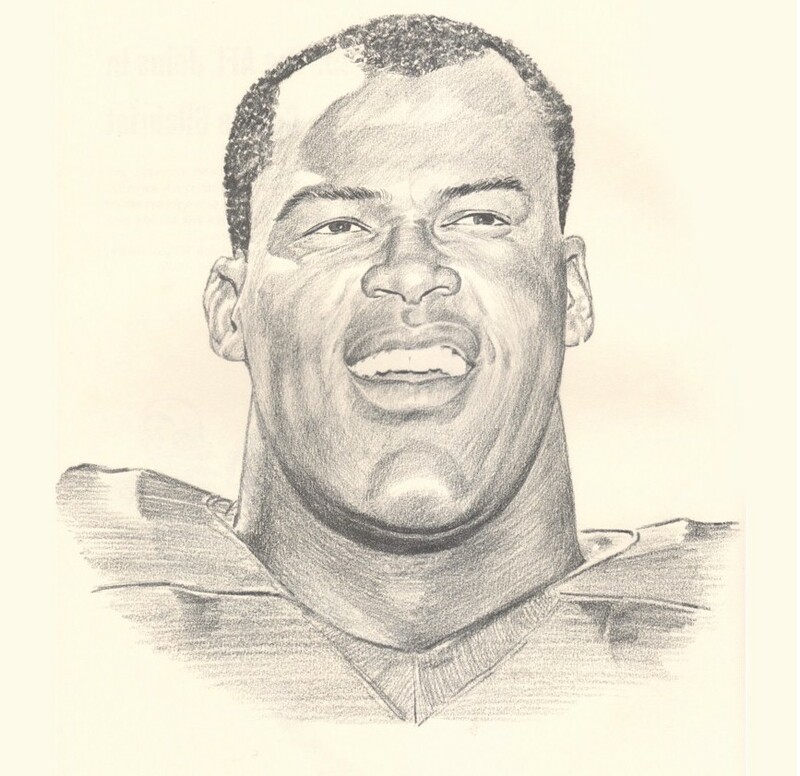 He was in Al Davis' corner when that George S. Pat�ton of a commissioner was shooting it out with the Na�tional League in pro football's version of the OK Corral. He views the AFL's merger with the older league with all the approval Winston Churchill felt toward Neville Chamberlain's diplomacy in Munich. A considerable chunk of Coniglio's spending money was sunk into postage and stationery for his one-man crusade to win the AFL's dovish owners to his way of thinking. No dice. 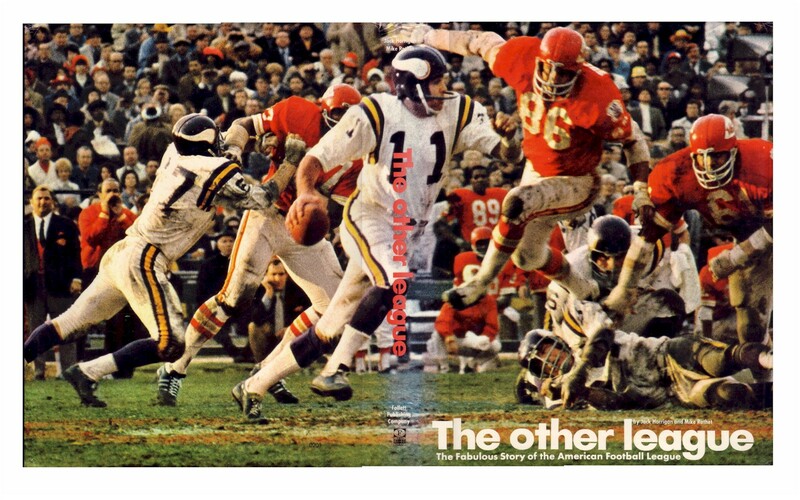 "The name American Football League will be lost for�ever after this year," he says sadly. 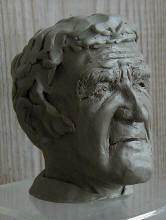 "The whole thing will be diluted under one name, the National Football League. I'll bet the name 'American Conference' (which that part of the NFL housing the old AFL teams will take next season) will be gone in a few years. 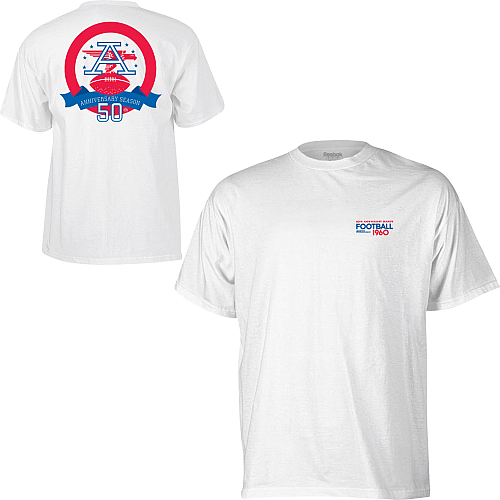 "Remember when the old All-America Conference was eaten up by the NFL in 1950? Well they had an Ameri�can and National Conference, too, but in a couple of years they were the Eastern and Western Divisions. "Everybody's been waiting for a long time to see the APL all-stars play the NFL all-stars. When it finally hap�pens, they'll probably call it the Pro Bowl, just as if it was the NFL West vs. the NFL East." The unkindest cut of all for Ange came last August, when the APL Guide book came off the presses. "Look through it," he commands. "Notice something missing? I'll tell you what's missing. 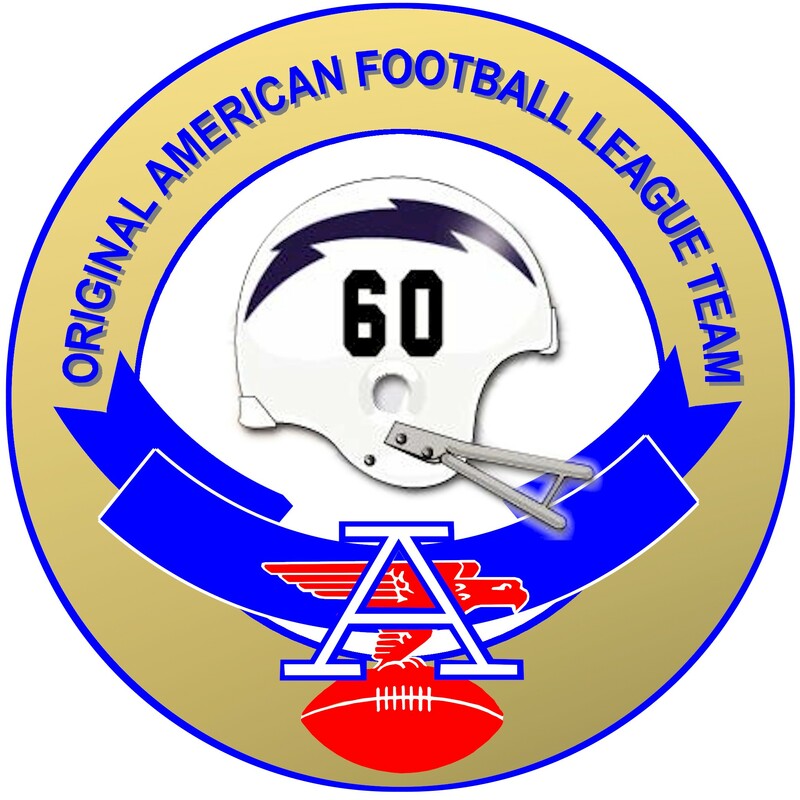 The old APL eagle, the league's symbol since it started. They even surrendered that a year ahead of time." But while the APL may die at 410 Park Ave. - the headquarters of pro football - and on the nation's sports pages, it will live in the Coniglio's comfortable little cape cod on Maynard Dr. Seated at his kitchen table, Angelo furiously dispatches his letters. One to the people at Dinty Moore's corned beef, informing them he will no longer consume their product (which he loves) because they have formed an unholy alliance with NFL Properties. Ditto for Chase and Sanborn coffee. 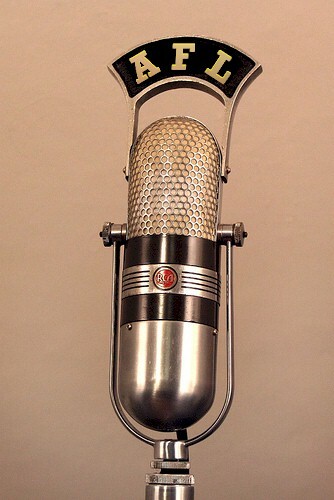 A couple more are sent to Chrysler and TWA for continuing their sponsorship of APL telecasts on NBC. NBC itself is a regular on the Coniglio mailing list. Ange feels that the network's sportscasters, above all, people should be the most enthusiastic promoters of the league. 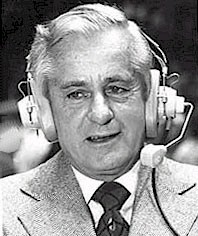 It's enough to make him leap right up off the sofa in his early-American living room to hear a Curt Gowdy mispronounce "Guidry" (Gidri) - or to witness an Al DeRogatis messing up on AFL lore. Down in the recreation room in the Coniglio basement is Christendom's only "AFL OFFICIAL FOOTBALL GAME" for children. It's not the creation of Milton Bradley or Parker Bros. It sprung from the fertile imagi�nation of Angelo F. Coniglio. "Actually, it was an NFL Official Football Game orig�inally," admits Coniglio. "You couldn't buy an AFL game at all until recently. There had never been one on the market. But I was determined that my 7-year-old son (also Angelo. Dad is Ange. Mom is Angie. Three-year-old daughter is Angela) would have an AFL game." 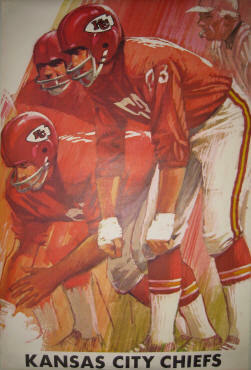 game with drawings of Buffalo and Kansas City players. 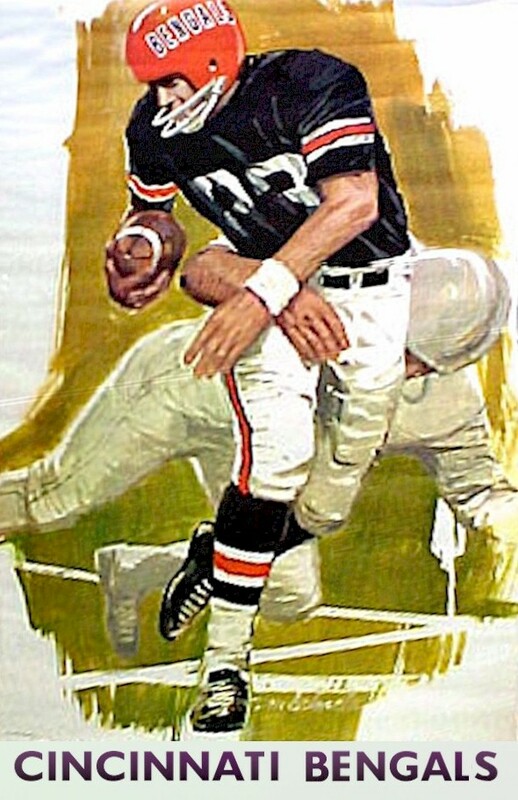 He cut out the helmet insignias of the AFL teams and pasted them over the NFL helmets on the selection dial, substituted the APL� 2-point conversion rule and per�formed a "de-Stalinization" process on every other re�minder of the older league. Then there are his half dozen scrap books, containing samples of his correspondence. Art Rooney, the kindly Pittsburgh owner, gave him a lot of encouragement even when the leagues were fighting. He has some polite, but frosty, letters from the commissioner's office. 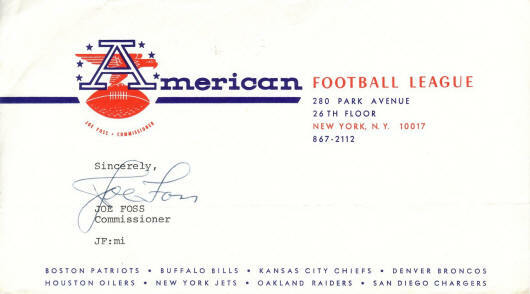 Lamar Hunt of Kansas City and Billy Sullivan of Boston regularly answer his suggestions about retaining AFL identity. 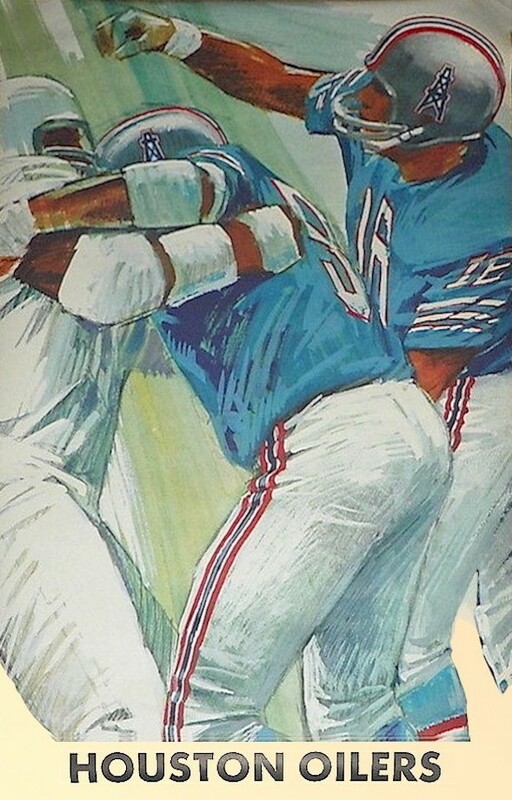 Bud Adams, the Houston owner reputedly worth hun�dreds of millions, sends his replies with 10� postage due. "Friends send me the papers from all over," says Coniglio. "They know I'm a nut." The strange part is that Coniglio has been a "nut" for a relatively short space of time. He was a cheerleader at Lafayette High School in the early '50s. ("I'm probably a frustrated athlete," he admits). 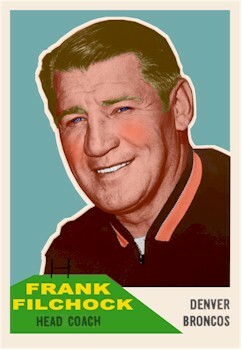 He saw a few pro games when the old Buffalo Bills had a team in the All-America Conference. Coniglio is a graduate of the University of Buffalo and used to attend their games on a semi-regular basis. 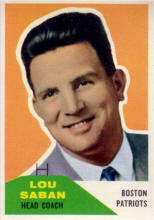 He was really turned on by pro football in the early '60s, when general interest in the Bills grew here. He and his wife just don't miss home games, even though she's had several serious illnesses and surgeries during the last few years. He can be a stern grandstand critic, but one thing he never does is boo. Not even the visitors. "I feel that every player out there is doing his best," he explains. "That goes for the officials, too. And I feel that if you boo the opposing players, you downgrade your own competition." 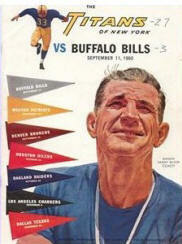 Talk of the Bills leaving Buffalo some time ago sank him into a state of depression. "It would destroy my world," he says. If that had happened, there would have been no chance of him following. 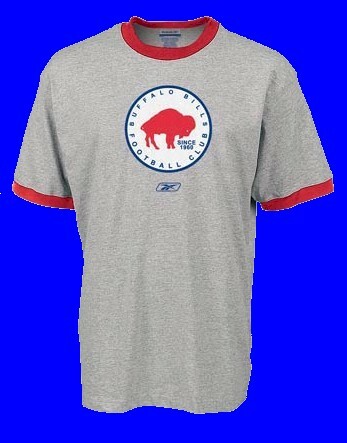 More than a Bills' fan, he is a Buffalo fan. "A few years ago I was walking down a street in Sacramento, Calif., where I had been offered a good job," he says. "I got to thinking about how much I liked Buffalo. How the area has four seasons. How I would miss making a snowman in the winter with my children. How no place has anything to compare with our autumn. "I really love this area." "I was thinking the other night," he said recently. 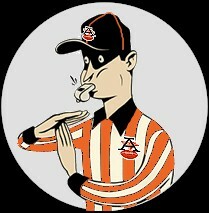 "I could copyright the AFL insignia and make it mine. The Kansas City Chiefs are honoring the American Football League and its driving force, Lamar Hunt, with a permanent AFL-LH patch on their uniform jerseys. I call on all former AFL teams to do the same, to memorialize the league that was the genesis of modern Professional Football, and the men who had the vision to make it so. 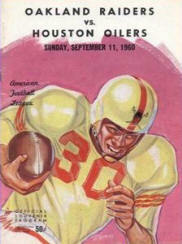 Game-day programs from the first week of American Football League play. Click on the above bumper sticker to make your own. The nineteen-sixties were a time of turmoil, vision, and change. The Cold War; the Kennedys; the race for the moon. Personally, it was the decade of my marriage, and the births of my children: in short, the best time of my life. In sports, too, the winds of change were blowing: goodbye, Bronko Nagurski, George Halas, three yards and a cloud of dust. 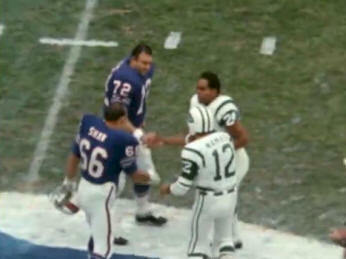 Hello, Lance Alworth, Tom Sestak, Joe Namath and Johnny Robinson. So long to the Browns' orange pumpkins, hello to the Bolts! The 'sixties: it was Camelot, it was the Beatles, it was Mare Tranquilitatis, it was "Aquarius": it was the AFL. 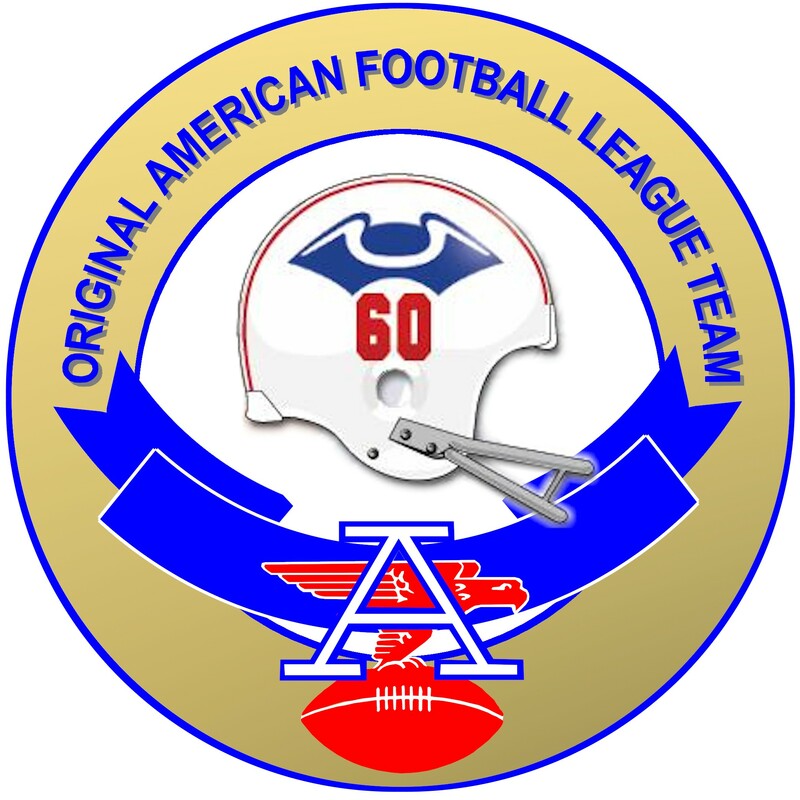 Of all the leagues that have attempted to challenge the dominance of an established league, the American Football League was the only one to be truly successful. The American Football League was the only league in North American pro sports ever to have merged with another major league and have all its teams continue to exist. No AFL teams folded and only two teams changed cities during the league's 10-year existence. 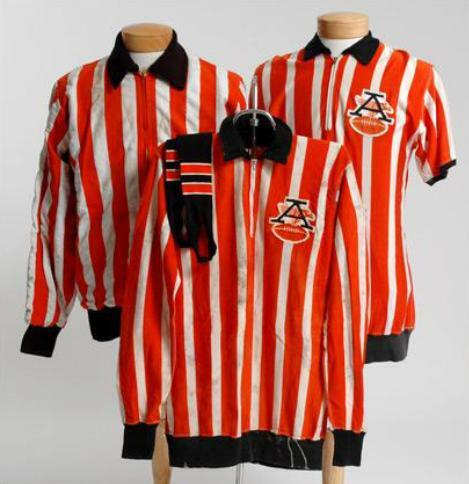 Further, the league that merged with it adopted many of the innovative on- and off-field elements introduced by the AFL, including names on player jerseys, official scoreboard clocks and gate and revenue sharing. 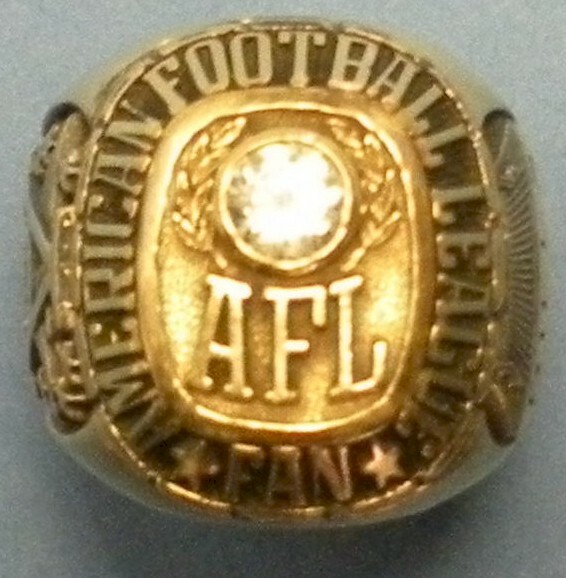 The AFL's challenge to the NFL also made possible the only four World Championship Games ever played between the champions of two major football leagues. 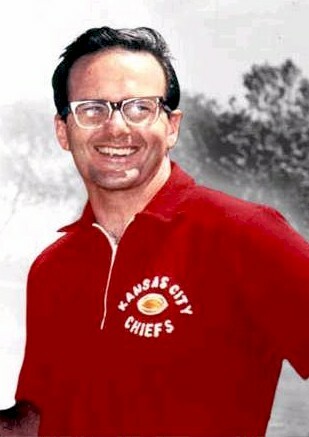 Lamar Hunt's vision brought a new Professional Football league not only to California and New York, but to parts of the nation that did not previously have the sport: New England, Colorado and Texas. It would later be brought to Missouri and Florida. 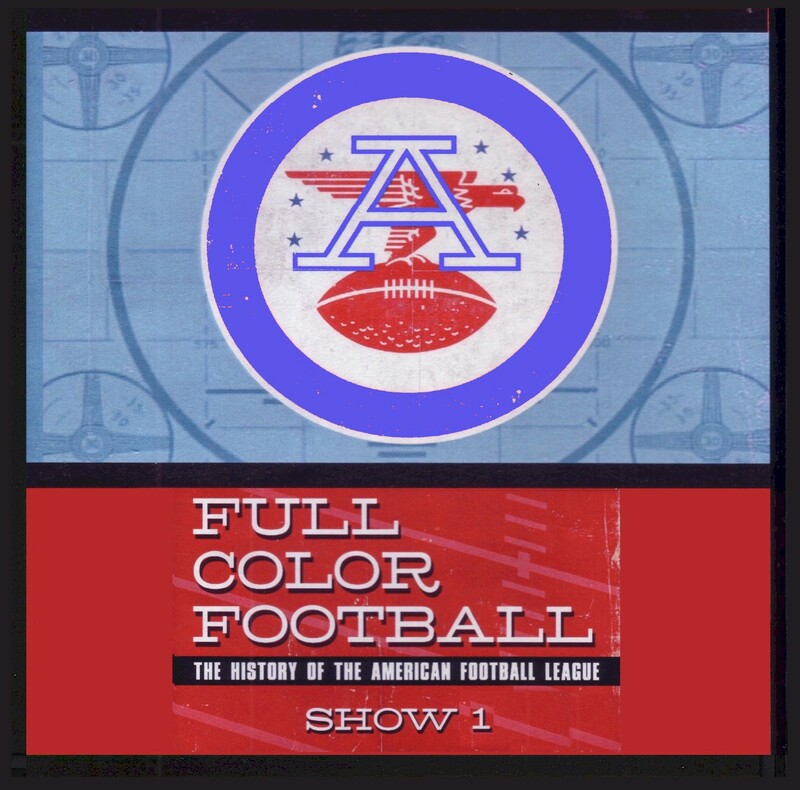 The AFL also adopted the first-ever cooperative television plan for Professional Football, in which the league office negotiated an ABC-TV contract, the proceeds of which were divided equally among member clubs. An AFL legacy seldom acknowledged is the fact that four cities obtained NFL franchises as a direct result of the competition the old league was forced into by the AFL: Dallas' Cowboys were created to drive the AFL's Texans out of business; the Minnesota Vikings were the NFL franchise given to Max Winter for abandoning the AFL (the AFL franchise later went to Oakland); the Atlanta Falcons franchise went to Rankin Smith to dissuade him from purchasing the AFL's Miami franchise; and New Orleans was given a franchise to repay the Louisiana congressmen who supported the bill permitting the AFL-NFL merger. It is most likely that if the AFL had never existed, neither would the Dallas Cowboys, the Minnesota Vikings, the Atlanta Falcons, nor the New Orleans Saints. The AFL's more liberal policies towards black players and its rigorous recruitment of players from black and small colleges revealed a new source of talent for Professional Football. AFL scouts, including blacks like Tom Williams and the first full-time black scout, Lloyd Wells, recruited and opened the gates for the hundreds of talented blacks who subsequently contributed immeasurably to the sport, following in the footsteps of Abner Haynes, Buck Buchanan, Lionel Taylor and the like. The AFL's free agents came from several sources. Some were players who could not find success playing in the NFL. The sports media in established NFL cities called them "NFL rejects". But the success of men like the Oilers/Raiders' George Blanda, the Chargers/Bills' Jack Kemp, the Texans' Len Dawson, the Titans' Don Maynard, the Raiders/Patriots/Jets' Babe Parilli, the Pats' Bob Dee and many others, made that sobriquet questionable. 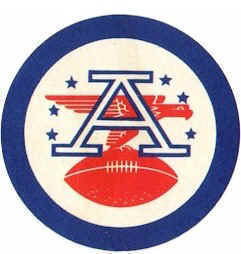 Another source of free agents was the Canadian Football League. 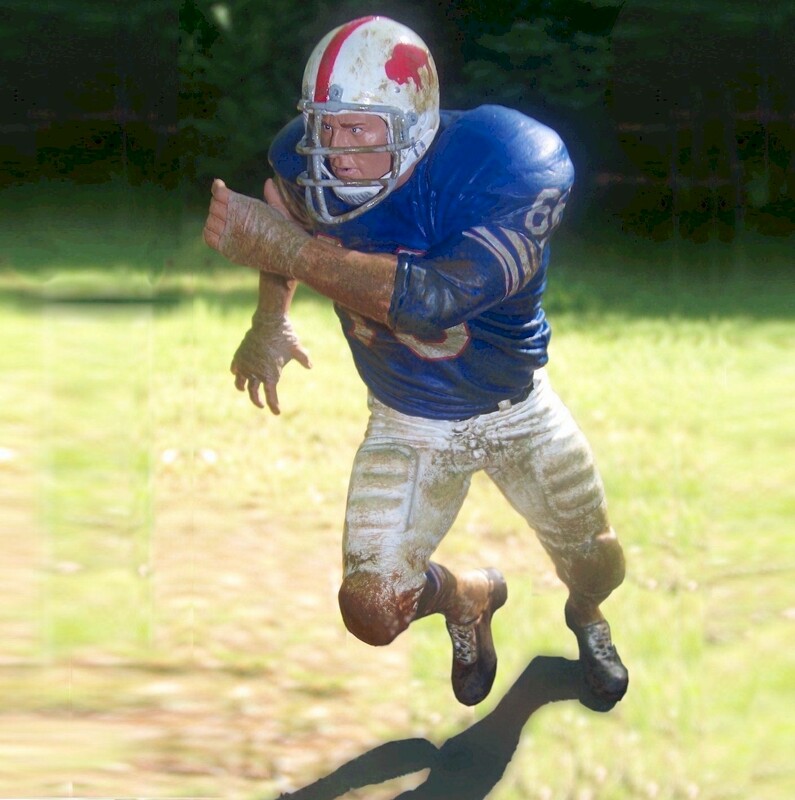 In the late 1950s, many players released by the NFL, or un-drafted and unsigned out of college by the NFL, went North to try their luck with the CFL, and later returned to the states to play in the AFL. 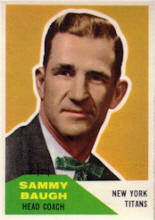 In the league's first years, these included the Broncos' Frank Tripucka, the Pats' Gino Cappelletti, the Bills' Cookie Gilchrist and the Chargers' Tobin Rote, Sam Deluca and Dave Kocourek. Finally, there were the true "free agents", the walk-ons, the "wanna-be's", who tried out in droves for the chance to play Professional Football. 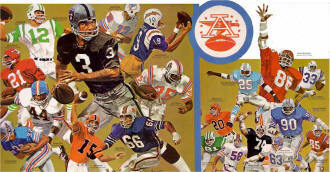 The American Football League took advantage of the burgeoning popularity of football by locating teams in major cities that lacked NFL franchises, and by using the growing power of televised football games (bolstered with the help of major network contracts, first with ABC and later with NBC). It featured many outstanding games, such as the classic 1962 double-overtime American Football League championship game between the Dallas Texans and the defending champion Houston Oilers. It was the longest Professional Football championship game ever played, and is still considered one of the best. The AFL appealed to fans by offering a flashier alternative to the conservative NFL. Team uniforms were bright and colorful. Long passes ("bombs") were commonplace in AFL offenses, led by such talented quarterbacks as John Hadl, Daryle Lamonica and Len Dawson. While the old league kept its time on a watch in the referee's pocket, occasionally announcing the time remaining, the AFL put it on the scoreboard clock, for fans to keep track of at a glance. While CBS had a fixed camera on the fifty yard line for its NFL coverage, ABC and the AFL had moving sideline cameras and were the first to "mike" players during games. 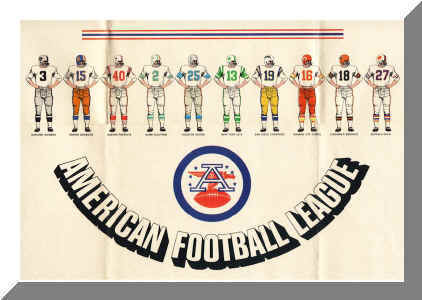 Another attractive feature of the American Football League was its competitive balance. In the original eight-team league, in a fourteen game schedule, each team played every other team twice. Every team had the same "strength of schedule", so the division champions were clearly the best teams in each division. 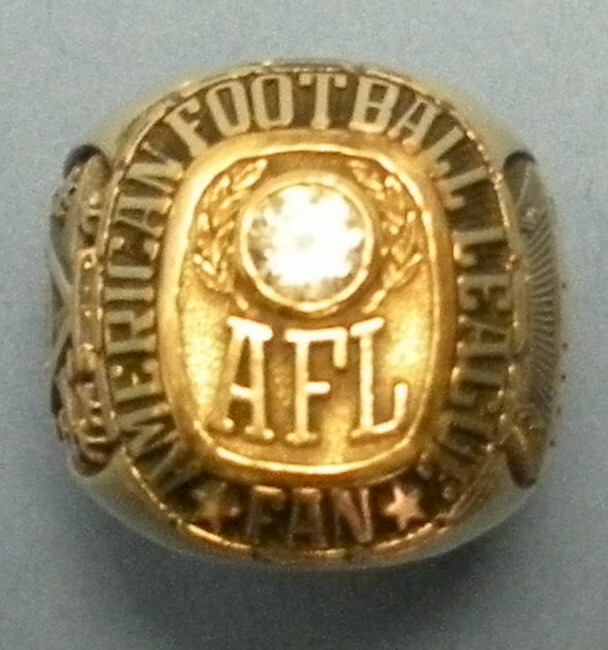 Further, the league championships were evenly divided: five were won by Western Division teams, five by the Eastern Division; and of the original eight teams, all but two (Denver and Boston) won at least one AFL title, and only one did not make the playoffs at some time during the league's ten-year existence. The AFL clearly matched or outshone the old league in many cases. 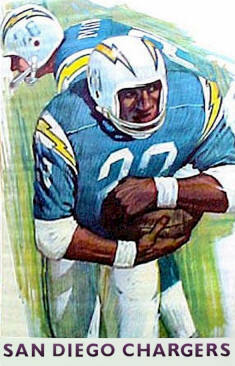 Examples abound: Lance Alworth of the Chargers was arguably the best receiver of the 1960s; Johnny Robinson of the Chiefs, although he has been ignored by the "pro football" hall of fame, was the equal of any NFL defensive back of the era; and the 1964 Buffalo Bills defense allowed their opponents only 300 rushing attempts and held them to a Professional Football record 913 yards rushing, while recording fifty quarterback sacks in a fourteen-game schedule. The AFL achieved its success in spite of sparse coverage by the print and electronic media. 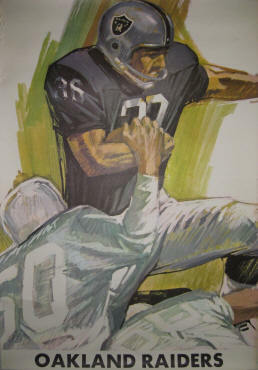 CBS-TV, which then carried NFL games, refused to give AFL game scores on its football broadcasts. 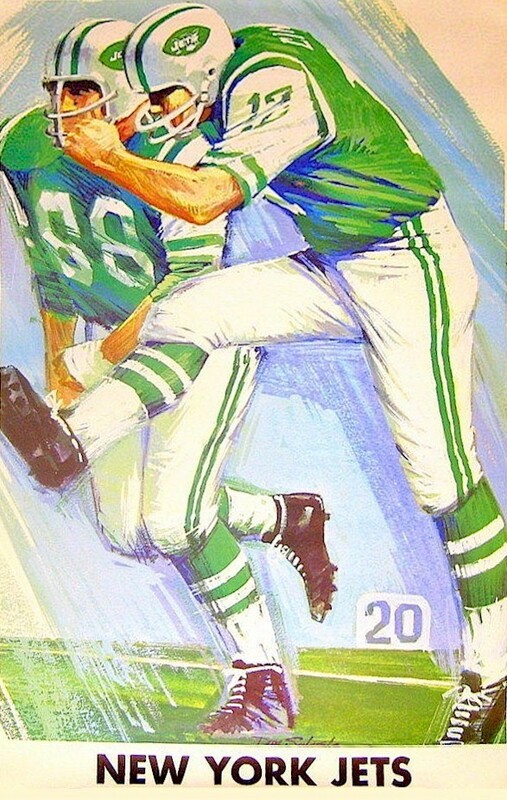 William N. Wallace of the New York Times and Tex Maule of Sports Illustrated ridiculed the new league, and even after the AFL was established, SI gave full-page color action shots of the NFL, while it used black and white photos in its AFL coverage. This bias is in many cases still evident today: in the reporting of AFL players' experience as "NFL experience" (e.g. Ron McDole is called a "17-year NFL veteran", when in actuality, he played eight of those years in the AFL); in the restoration of the Browns' name, colors, and records to Cleveland after the team moved, while Houston, the city that hosted the first two AFL champions, is forbidden to use the name "Oilers"; and in the inexplicable absence of AFL stars like Haynes and Robinson from the "pro football" hall of fame. 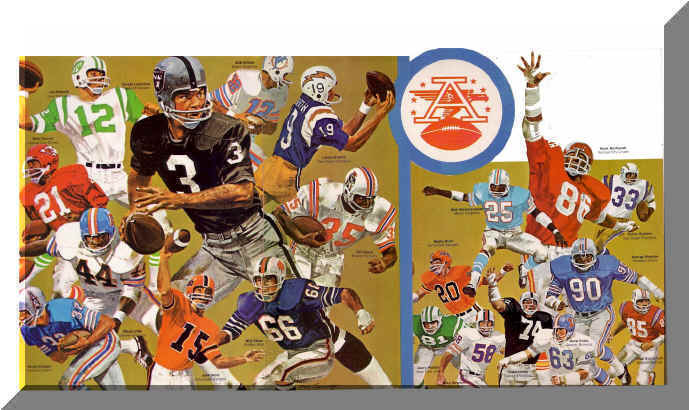 the American Football League has had on modern Professional Football. 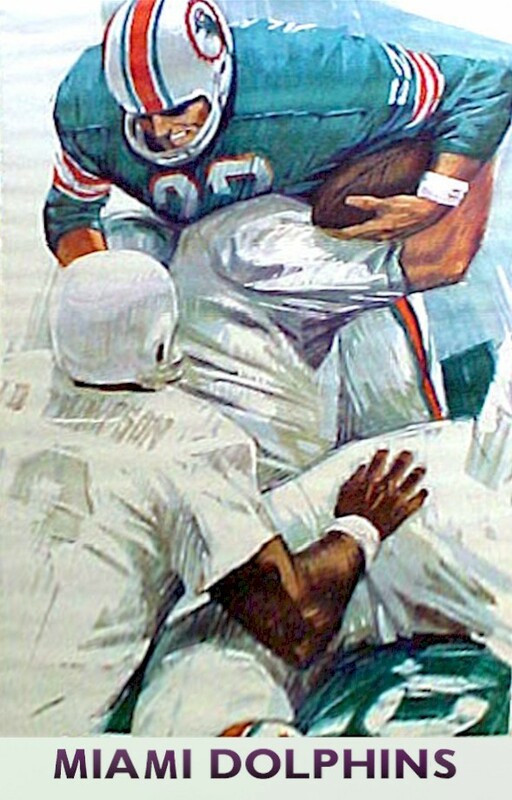 Some innovative rules changes were also put into place, such as the two-point conversion (later adopted by the NFL in the 1990s); the use of the scoreboard clock as the official game clock (adopted by the NFL when the leagues merged--prior to this time, the official game clock was maintained by an official on the sidelines, and often did not match the scoreboard clock very closely); the use of player names on jerseys, (also adopted by the NFL); and the sharing of gate and television revenues between home and visiting teams (also adopted by the NFL). 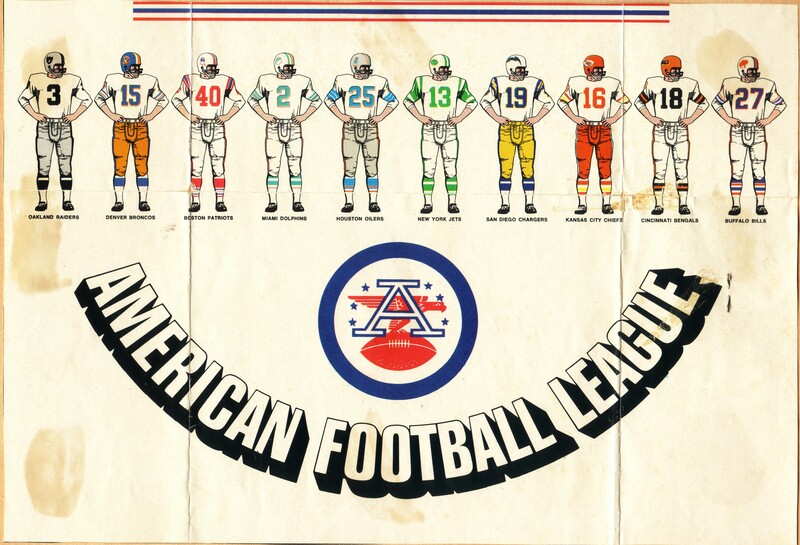 In short, the NFL adopted virtually every pioneering aspect of the American Football League, except its name. I am of a mind that the two great sports developments of the post World War II era, the AFL and NASCAR, both deserve a masterful scholarly analysis. 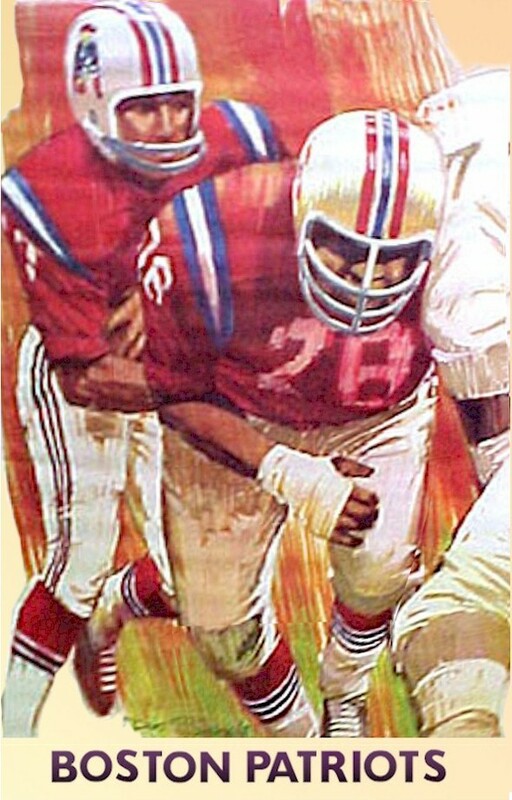 Almost every element that makes pro football the world's most popular sport that it is today can be traced to the American Football League and the huge changes its presence eventually brought to the sport. The AFL had a history that is a large part of the modern National Football League that we know today. Click here to hear a 2010 interview about the American Football League on "Think or be Eaten", with Keith Hansen and AFL fans Larry Hillman and Ange Coniglio. The 1969 regular season started with the Jets at Buffalo. Hundreds of Bills fans (including me) greeted the Jets at the Buffalo airport, shouting "Thank you Jets!" When the visiting, defending World Champion Jets, the Bills' AFL Eastern Division rivals, ran onto the field at War Memorial Stadium, a sellout crowd of 46,151 Bills fans gave them a standing ovation, and the Bills Cheerleaders honored them by displaying a green and white sign reading CHAMPS! What other league ever had fans as loyal? Three NFL teams made it to a true world championship contest. 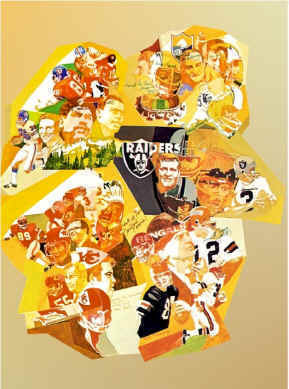 All of them were touted, in their turn, as "THE GREATEST TEAM IN PRO FOOTBALL HISTORY". Two of them lost to American Football League teams. 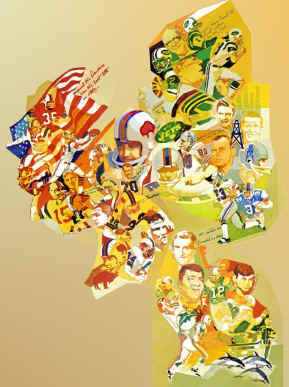 In the late 1960's, artist David Boss created posters for each of the American Football League teams. 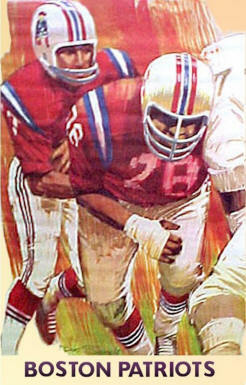 AFL fan Todd Kurlan sent me some links to a few posters for sale on line. Jeff Fowler sent the Chiefs and Raiders images. I've 're-constituted' the ones I could find. If anyone has better images, I'd appreciate a copy. 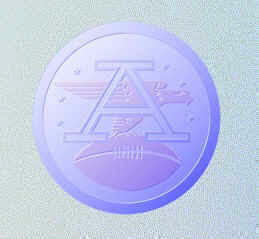 Head Coach American Football League ~ Forever! 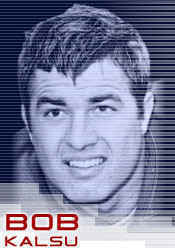 Six new members of the AFL Hall of Fame were added in 2010. PRO FOOTBALL HALL OF FAME! Robert Phillips' pioneering site about the AFL has been restored. 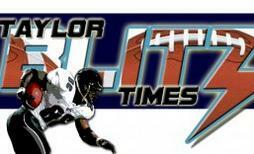 Click on the afl-football.50.webs.com banner, above, to see his site. To see a story about his original site, click the CNNSI logo below. AFL clips, history, and more. 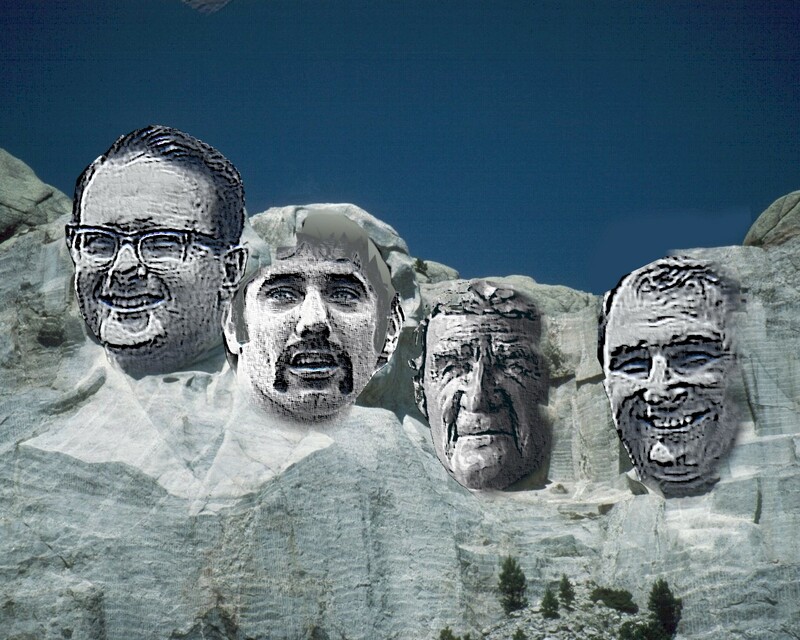 The Hall of Fame Honors the AFL! 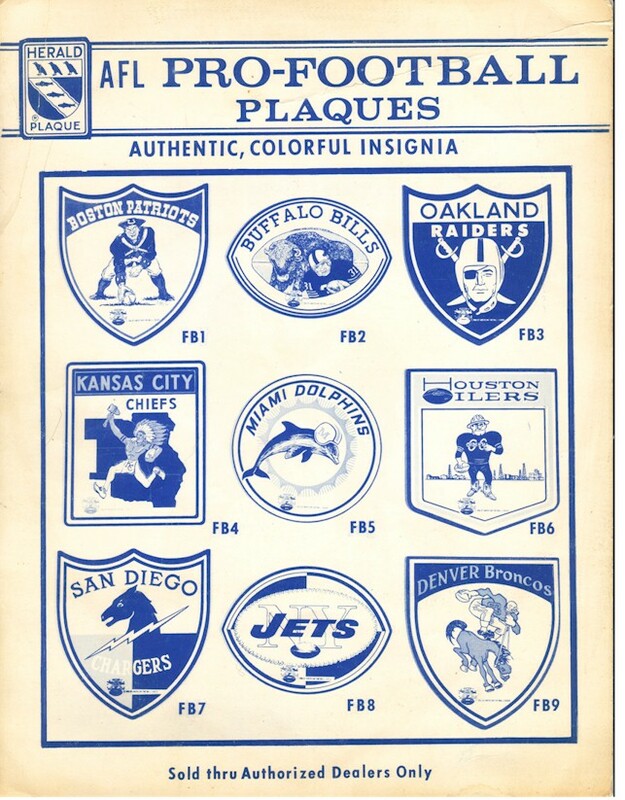 COLOR BY NUMBER ColorByNumber.htm and "other AFL stuff"
When did EXHIBITION games MEAN something? 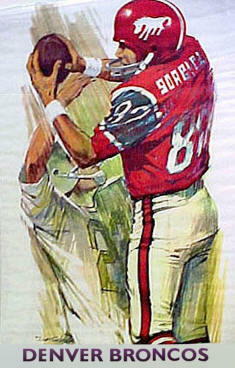 What Pete Rozelle DIDN'T Do. 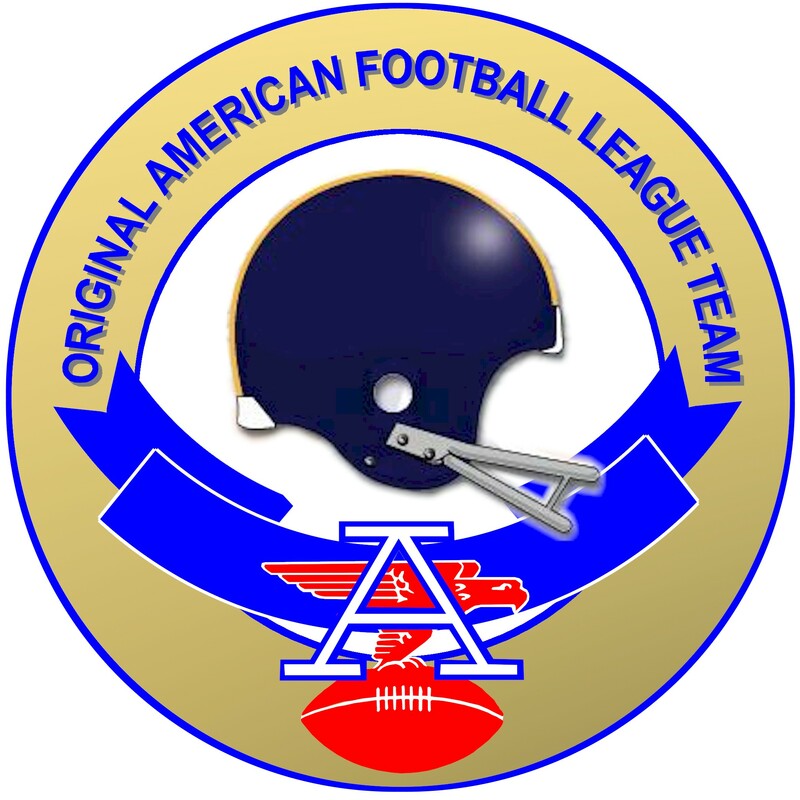 This page is to expose the misguided souls who did (and do) their best to disrespect the league that was the genesis of modern professional football, the American Football League. What ails Pro Football research? baby boomers and sports historians. "Memoirs of a Mickey Mouse Fan..."
Angelo Coniglio is perhaps the AFL's greatest fan. He has been carrying on a one-man campaign to perpetuate the identity of his favorite league in its merger with the NFL. Mr. Coniglio has collected some of his opinions and reminiscences in an article which he calls "The Last Ten Years" or "Memoirs of a Mickey Mouse Fan" or "Welcome to the AFL." 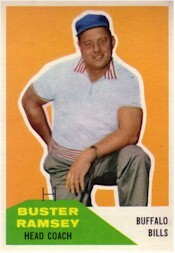 After 1970, the greatest success in modern sports history will cease to exist. After 10 years of ridicule and snobbery by the National Football League, the AFL will strike its colors forever and meekly join the league that called it "Mickey Mouse". 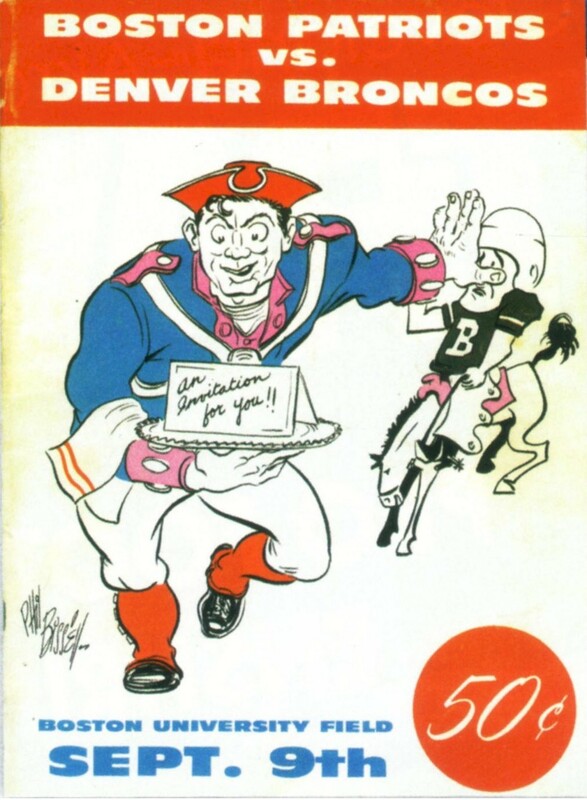 Oh, there will be an "American Conference", all right, as there was in 1950, after the AAFC was "merged into" the NFL (that "American Conference" lasted all of three years). 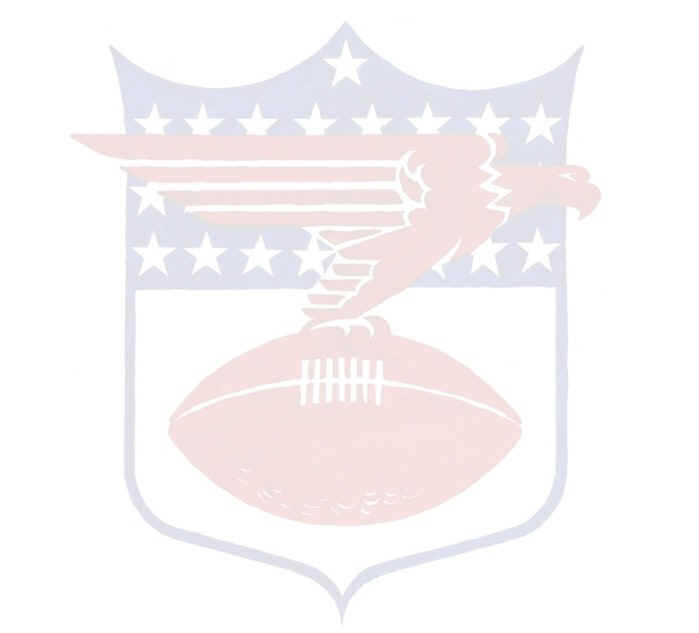 However, the name of the combined leagues will be the National Football League, and the distinctive emblem of the AFL, which is artistically head and shoulders above the NFL's dated shield, will be discarded. Football fans who relished the inter-league games and looked forward to an AFL - NFL All-Star game will be disappointed. There will be no such game. It'll be the "Pro Bowl" instead. In fact, there will be no more Super Bowl and hence no world championship game, since after the merger, that game will degenerate into simply an NFL championship game. 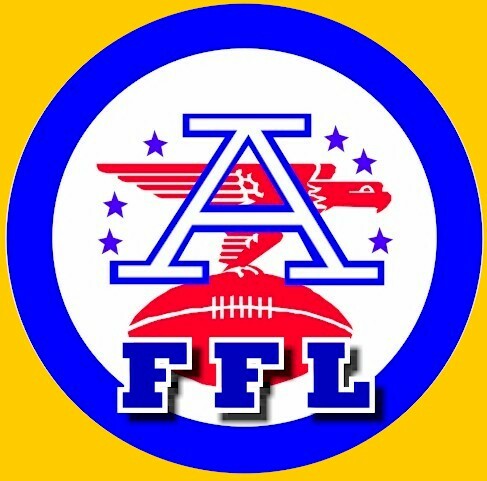 Before the AFL dies, I feel compelled to record some of the frustrations, sorrows, and triumphs of an American Football League fan. IT MAY HAVE been the belief of the "Foolish Club" (the AFL founders) that after one or two years, they would all be granted NFL franchises. Had that occurred, this fan would not have felt much dismay at the demise of the infant league. which the AFL gained superiority would also mark the greatest increase in the popularity of the NFL version of the game. 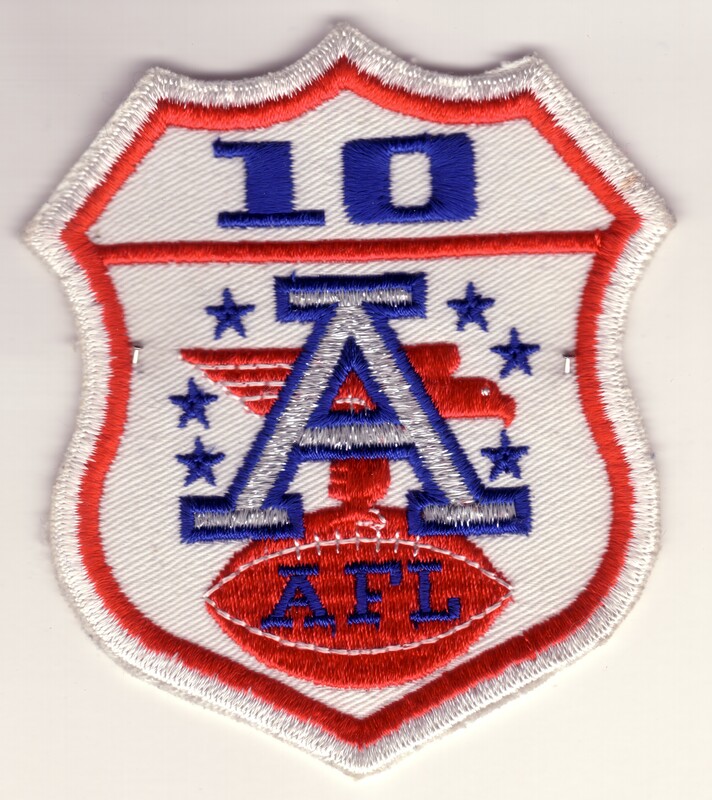 Not even the most avid AFL fan would contend that the overall quality of the AFL in 1960 was on a par with that of the NFL. It was, after all, a whole league of "expansion teams." But there were teams in the NFL in 1960 which would have found it rather difficult to achieve winning seasons in either of the AFL divisions. We saw strange and exciting football in those early years. The favorite play seemed to be the "reverse" on kickoff returns. And since there was plenty of scoring, there were plenty of kickoffs. 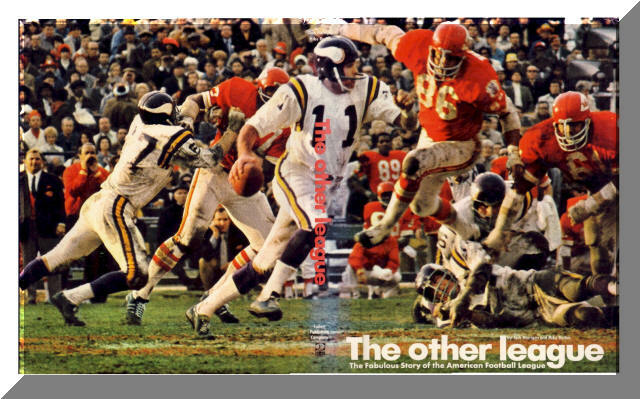 Len Dawson, or Jack Kemp. IN 10 SEASONS of play in the AFL, 232 players have been elected to All-Star teams. 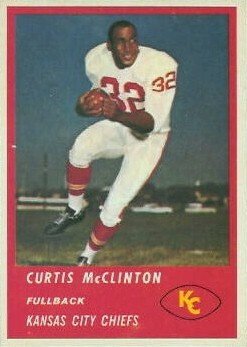 Of these 232, only 25 had ever played in the NFL. 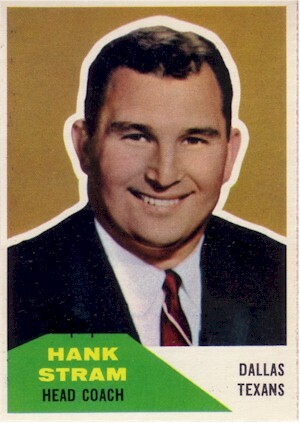 In 1960, seven of 22 were "NFL rejects". By 1968, every player on the AFL All-Star squad was a pure AFL player, and only two were "common draftees" (this in rebuttal to the myth that the AFL would need four or five more common drafts to pick up good rookies). It's amusing that each of the three NFL teams to make it to the Super Bowl was touted by the press as "possibly the greatest NFL team ever". Yet, two out of three of those teams lost to the AFL. Parity was reached in 1963! What of the first two Super Bowls? In 33 NFL championship games before the first Super Bowl, the average score was 36-11. That's right, the average winning margin in NFL championships was 25 points, but when the Chiefs lost by exactly that margin, it was considered a rout. The next year, the Packers, in an NFL playoff, beat the L. A.
Rams by 19 points. No one told the Rams they'd have to wait for a couple more drafts before they could play with the big boys, but that's what they told the Raiders when they lost by that identical margin. The Rams and the Raiders were both good teams who were beaten by a better one. That didn't prove that the Raiders played against "Patsies", any more that it proved the Rams did. IF THE AFL were not to die, in one or two years, every significant pro football record would be held by an AFL player, team or coach. In addition, the AFL now holds the majority of individual records in the short history of the Super Bowl. In 1965, I wrote to each of the owners of the 25 then existing pro football franchises, suggesting that a common draft, an inter-league championship, and an inter-league All-Star game were in the interests of both leagues. I received replies from all of the AFL owners, agreeing with my views. Only three NFL owners, responded however; Art Modell, Art Rooney, and Carroll Rosenloom. If those names sound familiar, they just happen to be the men who, four years later, agreed to shift their franchises to the AFL. away from us, and forced us out of Los Angeles and Dallas? If the AFL owners had held their ground, they could have forced the NFL to turn over two franchises in 1966, Atlanta and Dallas. 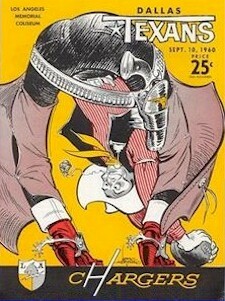 Then expansion could have evened out both leagues, and each would have retained its name. A big fuss is made over the fact that the "merger agreement" stated that there must be one league, and Congress is always mentioned in the same breath, implying monopoly charges if the "merger agreement" is not followed to the letter. I ask this simple question: Which is more likely to instigate charges of monopoly... one league or two? The AFL owners scored a stunning triumph in only nine years. Yet it seems their recent close association with the NFL owners has left them star-struck. Rather than expressing their great pride in their brainchild by insisting that it keep its name, they stumbled over each other in their hurry to discard the AFL and its emblem and embrace the NFL. IN SO DOING, they have humiliated hundreds of thousands of AFL fans who have watched their league accomplish in only 10 years what it took the NFL fifty years to do. So it all will end. 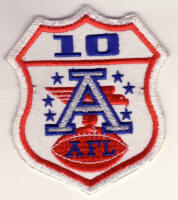 The year 2009 will be praised in song and story not as the 50th anniversary of the AFL, but as the 90th of the NFL. And no one will remember the AFL existed, except for a few fans with scrapbooks and long memories. 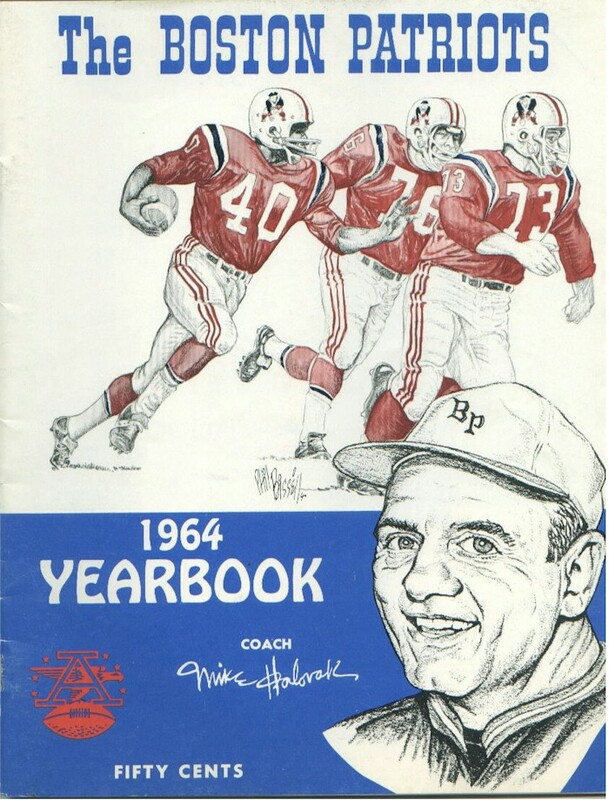 click here for more "Memoirs"
The American Football League Hall of Fame includes players and coaches who distinguished themselves on the field of play. Their stories are told elsewhere on this site. Those cited below played in the AFL, but it was their actions outside of pro football that brought them honor. 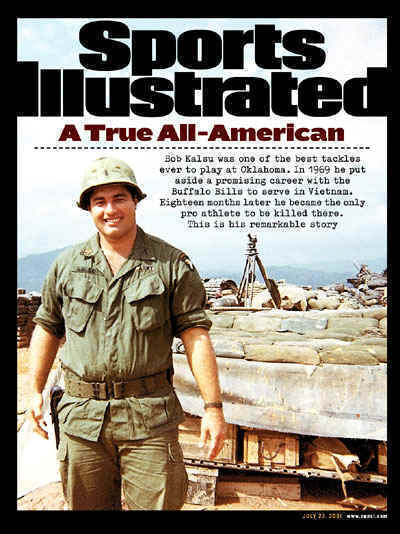 Bob Kalsu - one of two Pro Football players to die in the Viet Nam war. 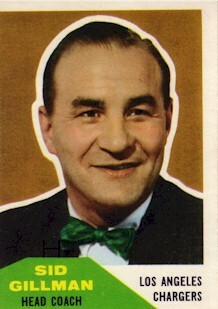 Bob Kalsu played in the American Football League for the Buffalo Bills. 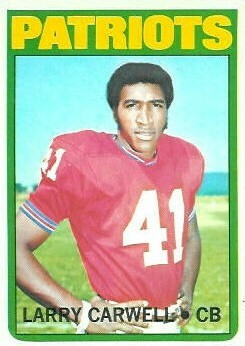 It is often reported that he was an NFL player who died in Viet Nam, but that's not true. 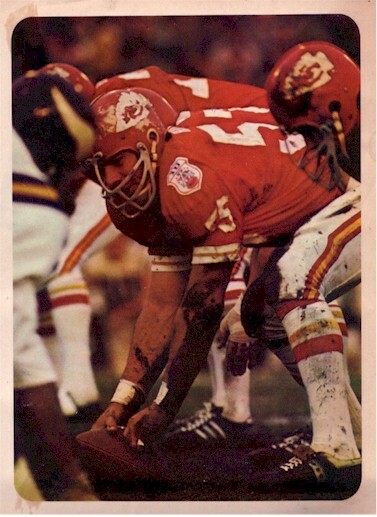 After starring at Oklahoma, he played in the AFL, where as an offensive guard, he was the Bills' outstanding rookie in 1968. With an expectant wife, when his unit was called to active duty, rather than seeking a deferment, Kalsu chose to serve in Viet Nam. Lieutenant Kalsu was killed by enemy fire in July 1970, while helping defend Ripcord Base on an isolated jungle mountaintop near Viet Nam's Ashau Valley. The book '75 Seasons' lists a 'Professional Football Team of the Sixties'. 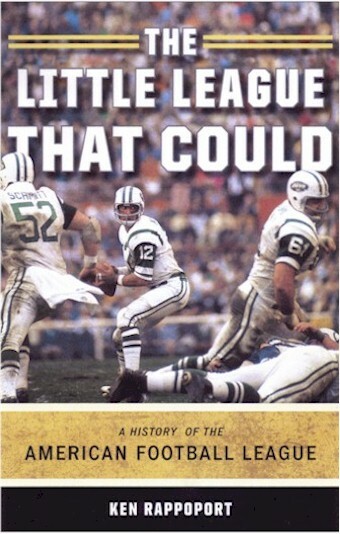 That the book was produced by the NFL is evident when you figure that for the bulk of the Sixties, there were 15 NFL teams, and 8 AFL teams, but there were eighteen NFL players and only seven AFL players chosen for this team by the NFL. In the sixties, Charley Hennigan's numbers were better than Charley Mitchell's; and Jerrell Wilson was a better punter during that decade than Don Chandler. The AFL players on the 'Team of the Sixties' are Billy Shaw, Ron Mix, Jim Otto, Lance Alworth, Bobby Bell, Willie Brown and Johnny Robinson. 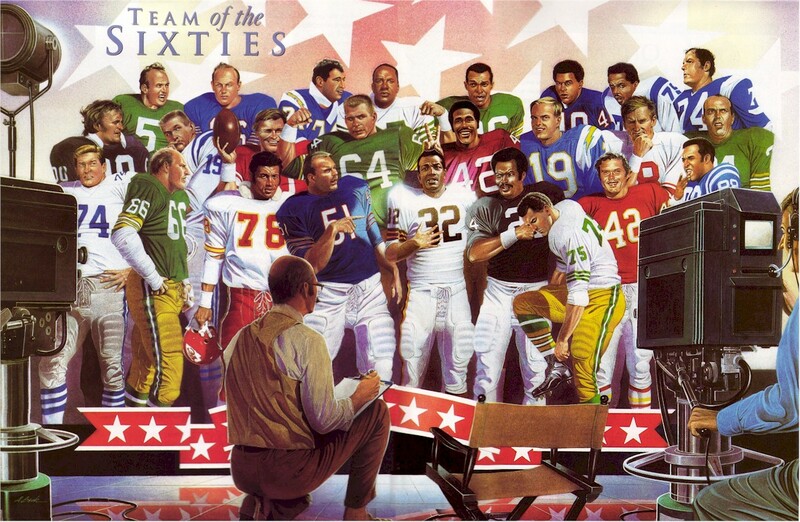 They're all in the "pro football" Hall of Fame except Robinson, who had statistics equal to Larry Wilson, who is standing behind him in the portrait. 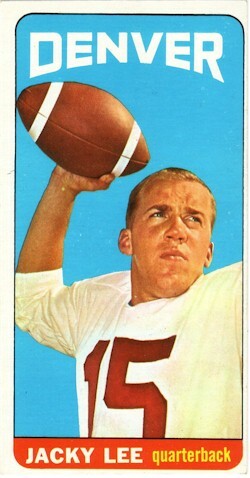 He also had three more League Championship rings than Wilson, and one more Super Bowl ring. To read about the AFL players, click on the player. American Football League players belong in the "pro football" hall of fame? If so, please write, call, or e-mail Mr. Steven Perry, the president of the hall of fame, and let him know.